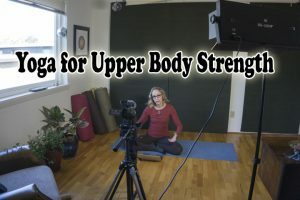 Today we are going to be talking about yoga for upper body strength, why it is so important, why yoga is good for strength and muscle and which yoga poses in particular are good for upper body strength. Why is upper body strength so important? The more muscle mass you have, the higher your resting metabolic rate. Strength training causes you to continue burning more calories for up to 72 hours after the exercise is over through a phenomenon called after-burn. Reverse the signs of aging. Some people lose up to 40% of their muscle mass by the time they reach their 60s. You don’t want that to be you! That will make you more at risk for injury and illness in general. The stronger you are, the more energy you will have. Strength training can be a great way to help manage chronic conditions from back pain, arthritis, obesity, heart disease and diabetes. It has even been an important part of the puzzle for me in managing migraines. Both have great upper body strengthening yoga poses in them. Why is yoga good for strength training? You are lifting the weight of your own body. In many yoga poses you are supporting your own weight against gravity. Variety: In a yoga class you are using large and small muscles and moving them in several directions (side bending, back bending, forward bending, twisting) rather than in the controlled environment of weight training. With yoga you are often doing eccentric contractions, that is your muscle is lengthening as it contracts, giving your muscles sleek, elongated look while at the same time increasing the length of your muscle and range of motion in your joints. Endurance: With the long holds in yoga classes, you are increasing muscle endurance. What was your biggest takeaway today? We have a whole Yoga for Strength Building Series in our Membership Community. Short Classes for each day of the week. This seven day series is designed to help you build strength in your body each day of the week. Monday you will focus on your core, Tuesday back, Wednesday chest, Thursday biceps, Friday triceps, Saturday shoulders and Sunday glutes. Each day we will create a fusion of yoga inspired poses and the best of strengthening exercises. In each and every class you will be strengthening your lower body while working your upper body. What topics would you like me to cover in future live streams? If you know somebody who would enjoy it, please share it with them. Make sure you subscribe to our channel so that you know when I am going to be live.